Retired August 1, 1973. Died February 26, 1996. Lieutenant General Otto John Glasser was deputy chief of staff for research and development at Headquarters U.S. Air Force in Washington, D.C., with additional duty as military director, U.S. Air Force Scientific Advisory Board. General Glasser was born in Wilkes-Barre, Pennsylvania, in 1918. He graduated from Cornell University in 1940 with a degree in electrical engineering. He was commissioned a second lieutenant in the Officers Reserve Corps in May of 1940, and was called to active duty with the Army Signal Corps in February 1941. For the next several years, he was assigned to the Caribbean area and was responsible for the installation and operation of early warning radar systems. He entered flying training in September 1943, graduated the following June, and then received transition training in the B-17, B-24 and B-29 aircraft. In September 1945 General Glasser was assigned as chief of the Radar Branch, Headquarters Continental Air Forces (later the Strategic Air Command), Bolling Field, Washington, D.C. In 1946 he attended Ohio State University for graduate training in electronic physics and received his master's degree in 1947. Following graduation, General Glasser was assigned to the Armed Forces Special Weapons Project, Albuquerque, N.M. In January 1951 he entered the Air Command and Staff School, Maxwell Air Force Base, Ala., and upon completion of the school in May 1951, he was assigned to Headquarters U.S. Air Force as chief, Munitions Branch, Research and Development Directorate. General Glasser joined the Air Research and Development Command in 1954, and went to the Air Force Ballistic Missile Division, Los Angeles. Calif. He was one of the initial group assembled to develop the first intercontinental ballistic missile. He later became program director for both the Atlas and Minuteman missiles. In October 1959 General Glasser was reassigned to Headquarters Air Research and Development Command, Andrews Air Force Base, Maryland, serving first as chief, Ballistic Missiles and Space Systems Division, and later as assistant deputy chief of staff, research and engineering. In February 1961 he was designated special assistant to the commander, ARDC, with additional duty as chief of the Command Special Projects Office. In July 1962 General Glasser was transferred to L.G. Hanscom Field, Massachusetts, as the vice commander of the Electronic Systems Division, Air Force Systems Command. He remained in this position until July 1965 when he was reassigned to the Office of the Deputy Chief of Staff, Research and Development, Headquarters U.S. Air Force; first as deputy director of operational requirements and development plans, and then to the position of assistant deputy chief of staff, research and development. In February 1970, General Glasser was assigned as the deputy chief of staff for research and development, Headquarters U.S. Air Force. His military decorations include the Distinguished Service Medal, Legion of Merit and the Air Force Commendation Medal. General Glasser is buried in Section 30 of Arlington National Cemetery. 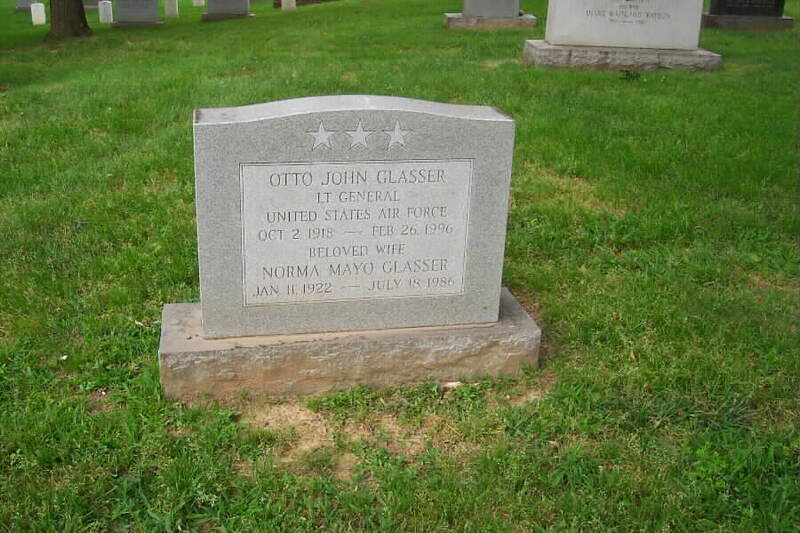 His wife, Norma Mayo Glasser (11 January 1922-18 July 1986) is buried with him.